A Lineholder or Reserve, who reported for duty on a designated holiday and whose trip cancels and where no reassignment is made involving that day, will receive holiday pay based on the number of hours from report to release (minimum of 2 hours). This equates to double time pay for the time on duty. Since there is no flight time to generate an automatic pay file, a Flight Attendant must submit a paper FAC (pay claim) to the Company for this holiday pay and any additional pay factors pertinent to the activity of the duty period. In the event of a Flight Attendant becomes ill mid-sequence of a holiday trip, will have her/his holiday pay calculated on whichever is less between the scheduled time away on the holiday or the actual time away on the holiday. If a Flight Attendant is authorized to deviate or deadhead home early, holiday pay is the lesser of the scheduled or actual time away from home (TMA) and hours away on the holiday. A Flight Attendant who is drafted from an ID/pairing, which includes time on a holiday to an ID/pairing that does not include holiday pay, will be pay protected for the scheduled time on the holiday of the original ID. The scheduled holiday pay must be converted to its flight hour equivalent and added to the flight hour value of the ID in which it occurs. This total flight hour value must be compared with the value of the drafting ID, and the Flight Attendant is paid the greater of the two values. 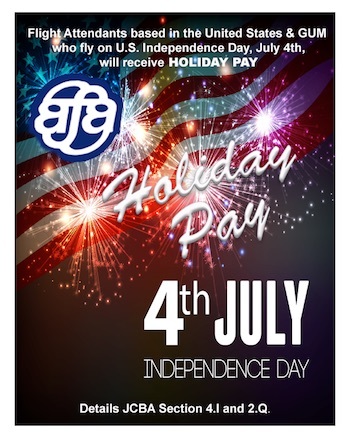 Flight Attendants can find additional information on Holiday Pay parameters in our JCBA, Section 5.L which outlines the formula for holiday pay and is available on our website @unitedafa.org.